DETROIT - The Detroit Red Wings have won four of their past five games. This brings Detroit's record to 5-8-2, putting them 7 points out of a playoff spot. That's quite remarkable considering their ridiculously bad start to the season when they went winless through seven games. Yeah, things were looking really, really glum for a couple weeks there. But how and why are they winning now? 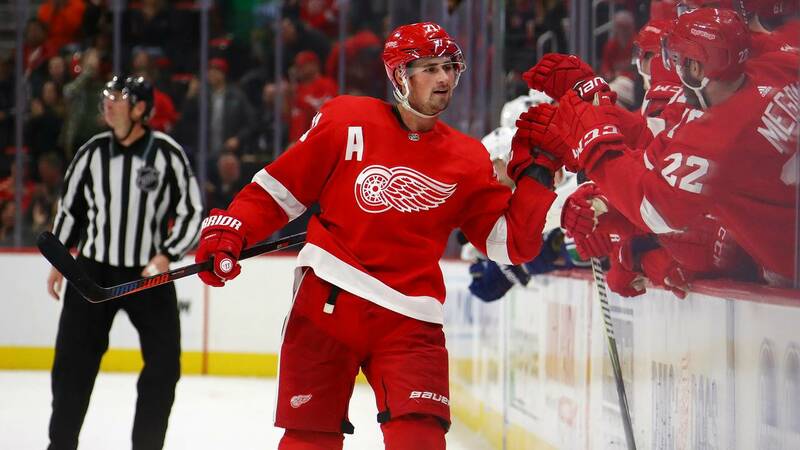 The Red Wings' recent success is largely due to strong play from Dylan Larkin, who continues to be a relentless force each game, and the resurgence of veteran goalie Jimmy Howard. Larkin tallied 7 points over the past five games. He scored the shootout winner against Vancouver. He is a faceoff machine -- another 16 wins this past game. He covers the entire sheet of ice, showing no signs of fatigue when most players would drop dead skating full speed for 20 minutes a night. He now has 15 points in 15 games, putting him on pace for an 80-point season. Larkin has a top-50 Corsi For (even strength) rating of 285. That means when Larkin is on the ice the Red Wings are spending more time in the offensive zone with better chances to score. In comparison, Connor McDavid has a 294 rating. The strength of these players may be obvious to anyone watching on a nightly basis, but the Corsi numbers offer unbiased reinforcement. Howard, meanwhile, posted a .952 save percentage and 40 saves in his shootout win on Tuesday. Overall, he has a .917 save percentage on the season, which is toward the bottom of the league, but keep in mind he's on one of the worst teams in the league. Right now he's finally starting to rack up some wins. It's obvious that Howard can help carry this Red Wings squad through some testy periods of play. He just needs to stay healthy. Staying healthy is also a key piece for him in his quest for a new contract. That's right: Howard's six-year contract with the Red Wings is up after this season. The 34-year-old needs a strong season, without an injury that forces him to miss a significant portion, if he wants to sign a nice deal. Will that be with the Red Wings? Well, let's put it this way: Detroit doesn't have anyone else outside backup Jonathan Bernier, who hasn't exactly been turning heads so far this season with a .873 save percentage. Ouch. The Red Wings blue line was considered the worst in the league heading into this season, and then they proved they were exactly that when they fell flat on their faces at the start of the season. After an 8-2 loss to the Bostons Bruins and a 7-3 loss to the Montreal Canadiens, things appeared as bad as can be for the Red Wings D.
Nonetheless, something good was happening. Rookie Dennis Cholowski was starting to show flashes of a great NHL career to come. He now has 8 points through 13 games and is giving the Red Wings a top-6 defenseman that they just didn't have a month ago. It's nice when rookies step up like this. With veterans Mike Green and Trevor Daley both healthy, and Niklas Kronwall serviceable enough to play 18 minutes a game, the Red Wings defense honestly isn't looking like the dumpster fire everyone thought they would. Moreover, it really helps when young forwards start to understand how to help their defense at the NHL level. Larkin is setting that example each night, and it seems to be catching on throughout the forward lineup. Don't you love Michael Rasmussen? Love is a strong word, but in all seriousness Rasmussen is yet another rookie who is playing way above his pay grade right now. He has three points over the past four games. He's finding scoring opportunities and using his size and strength to his advantage when battling for pucks. This is what coaches like to see from young players. It's not necessarily about scoring goals for him right now, it's about building confidence and learning to play at this level. And yeah, goals help. The development of players like Rasmussen and Cholowski is really what's most important for Detroit this season, and the only way they can develop is if this team is something more than the doormat they looked like in October. You don't want to see your team down 4-1, 5-0, 6-0 in the second period. The whole game just gets thrown out and you don't get to put players in real, valuable scenarios for learning. If the veterans who are on this team are going to play the minutes they are playing, then they must all buy in to helping these kids become strong NHL players. It appears this is the plan right now for Jeff Blashill, and it's working at the moment. The Red Wings are not a playoff team. If you think they are, then you are in for a terribly disappointing next five months of hockey. We're talking about a team that still struggles to score, doesn't play a full 60 minutes on most nights and can't match up against the league's top players. They have a hot goalie in Howard right now, a defensive corps that's relatively -- and uncharacteristically -- healthy, and a few young forwards who are carrying the load. This is not exactly a sustainable formula for winning, but we can hope they continue to get better while developing the young players. A back-to-back games weekend is on tap. This hockey newsletter is authored by Dave Bartkowiak Jr. He can be contacted at dbartkowiak@wdiv.com or on Twitter @DaveBartko. Sign up for newsletters here.